Seagate last week made two rather important announcements regarding its current and upcoming hard drives. First, the company said that it had shipped 35 million HDDs based on shingled magnetic recording (SMR) technology. Second, the manufacturer confirmed plans to launch commercial hard drives based on its heat-assisted magnetic recording (HAMR) technology by the end of 2018, the first time the company set a precise launch timeframe for such HDDs. 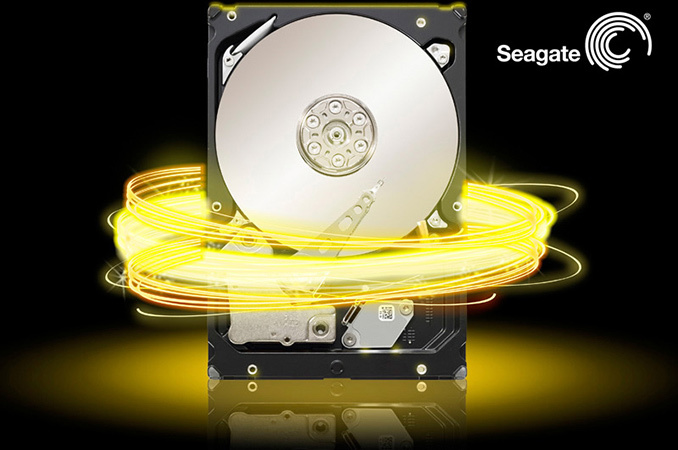 Seagate launched the Archive 8 TB, its first HDD based on SMR, in 2013. Due to the technology, it targeted archive applications - the majority of the archival workload is sequential writes, and the data is hardly ever updated, concealing peculiarities of shingled magnetic recording. As reported multiple times, to increase areal density, HDDs featuring SMR write new magnetic tracks that overlap part of the previously written tracks. This may slow down the rewriting process since the architecture requires hard drives to rewrite adjacent tracks after any writing action. To mitigate such peculiarities, Seagate incorporated various features into its device-managed SMR-based drives, which were described by Mark Re (CTO of Seagate) in an interview last year. Over the course of the recent years, Seagate has introduced several generations of SMR-based drives for archive, nearline, NAS, surveillance and mobile PC applications. Each generation refined the use of shingled magnetic recording technology in a bid to improve performance (for example, Seagate added SLC NAND-based cache to its 2.5” SMR drives) as well as improving areal density. During a recent call with investors and financial analysts, Stephen Luczo, CEO of Seagate, said that the company had shipped 35 million SMR-based hard drives and was about to launch its fourth generation of SMR-based HDDs. The head of the company did not elaborate on the benefits of the fourth-gen SMR, but Seagate has indicated that its platform is expandable for performance and areal density benefits. In fact, we already know from Western Digital’s announcement of a 14 TB HDD that the upcoming new-gen 3.5” SMR platters have a capacity of 1.75 GB per platter, so we expect Seagate to deal with disks of around the same areal density/capacity. What is noteworthy is that shipments of SMR-based drives are accelerating as Seagate expands use of the technology. Seagate shipped around four million of SMR HDDs in the first two years (from September 2013 to September 2015) and then shipments of SMR HDDs have comparatively skyrocketed over the past six quarters. The main reason why Seagate has managed to accelerate sales of its SMR drives significantly in a short period of time is because such HDDs are contained and managed in isolation, but also because they are drop-in compatible with existing data center and client infrastructure where these drives make sense the most. That being said, we suspect that certain large customers of Seagate still adjust their software before deploying such drives, eliminating unnecessary writes and thus optimizing performance and power consumption by another step from regular testing. To put Seagate's position into context, SMR-based HDDs from HGST are managed by hosts, which requires tangible investments from their customers. Even though the Ultrastar Ha-series is strictly aimed at clients who primarily appreciate raw capacities and relatively low power consumption (a feature of helium-filled HDDs), the integration issue is not such a big problem for Western Digital as the company still ships many high-margin products. Still, device-managed SMR expertise helps Seagate to address certain market segments with products that have no direct rivals. For example, the Seagate BarraCuda 2 TB HDD and the Seagate FireCuda 2 TB hybrid HDD have no direct competitors in the 2.5”/7mm segment. “By this time next year, we anticipate less than 10% of our HDD technology portfolio will be exposed to competing flash devices,” said Mr. Luczo. While it is inevitable that client HDDs will continue to compete with client SSDs, high-end special-purpose drives are going to complement what is available with NAND flash. High-capacity HDDs based on HAMR technology are not going to have direct flash-based rivals of the same price and capacity, therefore, it is important for Seagate to launch such drives sooner rather than later. During the conference call, Seagate indicated that HAMR-based HDDs are set to be released commercially in late calendar 2018. This is not the first time that Seagate has made a HAMR-related announcement, but this is the first time when the company has set a particular launch timeframe for such drives. Previously, Seagate has implied that the first HAMR-based HDDs would feature a capacity of 16 TB, which is a significant increase from 12 TB hard drives due to be released in the coming weeks. Given the fact that data centers cry out for high-capacity drives, it is inevitable that HAMR-based HDDs with increased performance and higher capacities will be in high demand. Keeping in mind that late 2018 (by “late” companies usually mean the fourth quarter) is over a year away, Seagate is not sharing details about experimental deployments of HAMR-based HDDs that may be planned for 2017/early 2018.